It's about time that I write a new post, I've definitely been slacking. I just returned to Vancouver after three weeks of being on the road racing around Canada. 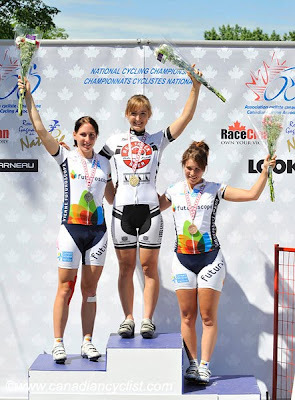 First off was the new UCI race held in Gatineau, Quebec, the Grand Prix de Gatineau. 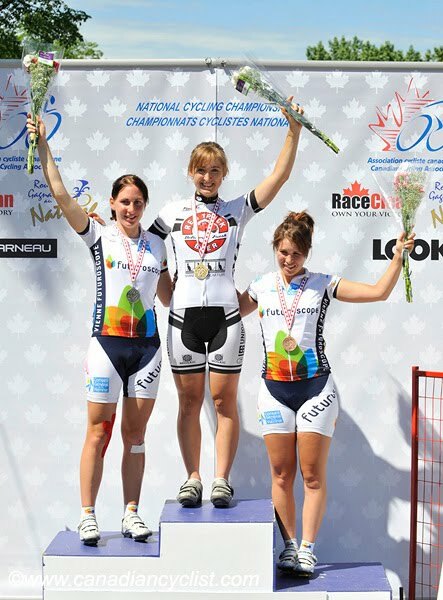 This race was created after all the Canadian UCI women's races were cancelled this year. 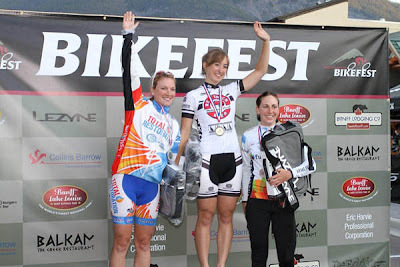 There was a strong women's field present at this race with numerous teams traveling from Europe and the states to race. The weather in Ottawa/Gatineau was the first time it actually felt like summer after all the BC rain and cold. The race itself was quite aggressive with a lot of attacks, though no moves ever stayed away so it came down to a sprint finish. The finish was pretty crazy, the course went around a 180* round a bout about 300 metres from the finish. A cyclist near the front took the corner too fast and caused a pretty bad crash. Luckily I narrowly avoided crashing and finished 6th! I had some extra time to do some touristing in Ottawa, so I went to observe the parliament buildings, eat hamburgers at the Works and contemplate strange modern art at the National art gallery (one display included a horse turned into a unicorn, preserved in formaldehyde.. strange). 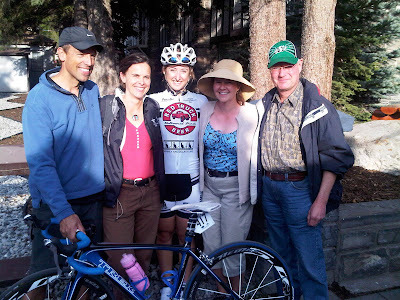 After Ottawa it was off to Banff to meet up with the Trek red truck team for the Banff Stage race. I had never raced this event before and it proved to be challenging, yet fun. Banff is such a great location for a race. The event started with a 1.5 km prologue right up a hill. I didn't pace myself very well, so ended up losing time on the second half of the climb. Next stage was the 1A sprint stage, a 80km road race on a highway near Banff. My team had been told before the race that the course was pretty flat. Being from Manitoba I know flat and I don't think this course could be classified as that. It was more rolling, and ended on a pretty decent 1 km uphill. The race was fairly aggressive, but it wasn't quite challenging enough of a course for a break to be established. I was happy to finish 2nd in the uphill sprint finish. The next day was the TT and crit. Banff has the most beautiful time trial course I have ever ridden. Where else do you ride through jagged snowy mountains, pristine mountain lakes and past mountain goats eating on the side of the road? The course started flat, then climbed up to a lake where you started to descend for the rest of the race. 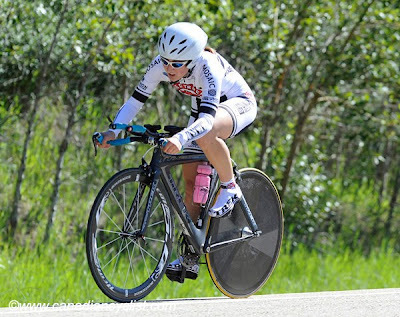 I was excited to race to test out my tt skills before nationals, this was only my second tt of the year. I was so pumped to finish 5th behind some of the best time trialists in the country. After the tt I was sitting 6th overall in GC, prizes went to top five and I only needed 2 seconds to make that. I was confident going into the crit. The course was very technical was a 180* turn right past the start/finish, and 4 corners after that on a fairly bumpy road. The 180* turn proved to be quite sketchy and there were a lot of crashes, one of my teammates crashed twice and another crashed once. For this reason, I tried to ride at the front of the race to avoid the carnage at the back. On the last lap, Andrea Bunnin threw in a strong attack going into the 180 and got a fairly good gap. I chased and caught her before the last corner, and managed to hold off the pack to win the sprint for the win! I also got a time bonus from the win and managed to finish 5th overall in GC. I think it helped that I had a personal cheering squad the entire race with Uncle Derek, Aunt Tara, Uncle Alan and Aunt Janet out to cheer me on. I found Uncle Dereks dance/cheer moves quite entertaining every time I went around the course. Next off was Nationals held in Edmonton. The first event was the TT held in Devon. The course wasn't the most exciting. It was an out and back course with some false flats, lots of wind and one descent and climb out of a river valley. Unfortunately my seat completely slipped down at some point during the race which didn't really help me out. It wasn't as good a tt as in Banff, but I still improved from last year's nationals and managed to finish 18th overall and 5th U23. The road race was next up. The women did 9 laps of the course for a 120 km race. The course had three climbs in it, most of them had turn arounds and you immediately descended. Right from the start, Lex Albrecht rode away from the group and nobody reacted. She got a pretty decent gap on the group (up to 4 minutes at one point). There were a few attempts to bridge during this time, but nothing stayed away. The pace finally did pick up eventually and we reeled her in pretty quickly. There were other attempts for breaks after this, but it was tough for anything to stick because the group would come back together on the descents. Getting in a good position for the final sprint was a little hectic. Joelle took the win, I managed to finish 7th overall in a fast sprint, and came out as 1st U23 which was awesome! I'm finally back in Vancouver now a little while to race BC superweek. I'm going to also be attending a track camp at the Burnaby velodrome. I'm sort of scared to ride the track but it should be fun!